Which Minnesota politicians does the ACA hurt/help most? I wrote here that the Roberts opinion, while fatally flawed, might turn into a blessing for Republicans. Chief Justice Roberts’ opinion makes it official that DFL legislators in DC voted for a massive middle class tax increase, one of the biggest in US history. Rest assured that Minnesotans will be repeatedly reminded of that through November. How dare Sen. Klobuchar talk about moving forward after voting for a massive middle class tax increase. How dare she talk about moving forward after voting for a massive excise tax on medical device manufacturers like Medtronic and Boston Scientific. The ACA doesn’t contain costs. It hides costs through subsidies. It doesn’t increase access to health care because it’s too reliant on Medicaid. That’s the health care kiss of death because doctors, clinics and hospitals get ripped off through Medicaid payments, thus causing doctors to stop seeing Medicaid patients. Sen. Klobuchar’s votes for the PPACA set health care in Minnesota back at least a decade. Isn’t it ironic that she’s talking about moving forward? Thanks to the PPACA, it’s impossible to go much further backward. 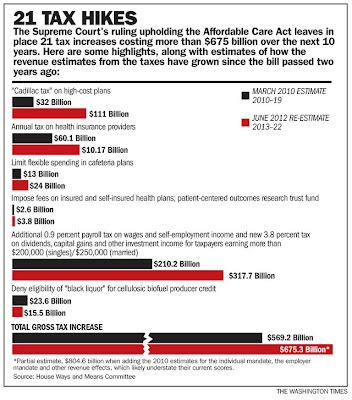 Rep. McCollum, take a look at this abridged version of the tax increases you voted for. Please tell Minnesotans how they’re helped by an annual tax on health care providers. Please tell middle class Minnesotans how they’re helped by the excise tax on tanning sessions. Please tell Minnesotans how they’re helped by the fees imposed on self-insured health plans. Even with MinnesotaCare, let’s remember that many Minnesotan families suffered without health care coverage for decades. The Court’s decision to uphold this law President Obama proposed and Congress enacted shows dramatic change can happen when the American people demand that change. Now we need to be vigilant in implementing the law. We have made an important step toward the goal of making sure all American families have the health care they need and deserve and I promise to continue working until that happens. Despite today’s victory, opponents of universal health coverage will continue their assault on health care access for the American people. Throughout this year, GOP lawmakers have tried to repeal or decrease health care benefits, including Medicare and Medicaid. We must continue to work together to protect vital reforms that will improve the health of every American. It’s a myth that we’ve achieved or ever can achieve universal health coverage. Medicaid is broken because the federal government rips off doctors, clinics and hospitals. In North Carolina and Virginia, rural hospitals shut their doors rather than participate in the Medicaid ripoff. 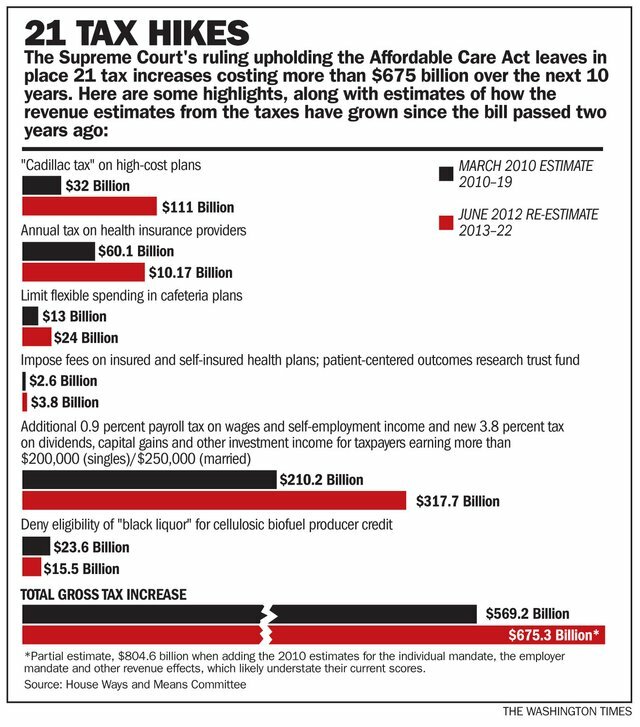 Unfortunately, what isn’t myth are the gigantic tax increases that were included in the PPACA. These Democrats, along with Sen. Franken, are the biggest losers through all this. That isn’t a prediction that they’ll lose their seats. Their votes, though, won’t be easy to defend. Republicans, though, should benefit from Thursday’s ruling. First, they didn’t vote for a health care plan that raised taxes on the middle class. They didn’t vote for a health care plan that doesn’t control costs. They didn’t vote for a health care plan that doesn’t insure the millions of uninsured. Roberts likes Romneycare. So what? Will the local Repulicans be running against Romney? President Obama was fighting an uphill re-election fight prior to yesterday. What he’s facing now is Mission: Impossible. People hate the ACA. In poll after poll, 40% of the people accept ACA. In poll after poll, 55% of the people hate ACA. President Obama won’t come close to getting 50% of the vote. Think more like 46-47%. Shame on Justice Roberts for rewriting legislation. The people will truly be heard in November. For anyone hiring people this is like a monthly poll tax. You are punished over and over for having an employee. This economy is already on shaky ground, now it is on thin ice. I am considering voting for Obama just to make sure he is jabbering in front of the teleprompter as this financial ship hits the iceberg and goes down. I want him and the Dems linked directly to the economic albatross as the ship sinks. This is 1931…I suggest prepping the lifeboats. A Romney/Pawlenty ticket is a loser…I’ll wait for the big government Dems and Repubs to go under…perhaps a tea party will emerge, something we can afford. You cannot rewrite the truth. You just attempted to rewrite the truth. The facts are the facts. The unemployment rate under Bush was 3-4 points lower than it’s been during President Obama’s administration. That isn’t my opinion. That’s the facts as reported by the BLS. That’s reality, Eric. These flights of fantasies of your’s don’t resemble the truth. Next time, come prepared to debate with verifiable facts, not this BS you’re peddling.